We’ve all probably seen Stanley Kubrick’s movie 2001. Its use of symphonic music, mesmerizingly slow expositions, fantastic futuristic sets, and what-the-heck-did-I-just watch ending are part of movie history. I dare say, however, that most people don’t know what the ending, nor the movie itself, was trying to communicate. I certainly didn’t the first few times I watched it in my college years. Rampant speculation and wild claims about it’s meaning have been made for years. I personally adhere to a much more practical and straightforward interpretation given by Kubrick himself, but there is even an official website devoted to answering these questions. 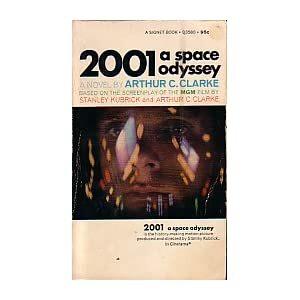 So, to help me understand better, I went and read Arthur C Clarke’s book version. The history behind 2001 is interesting. Kubrick wanted to make an epic space movie after pondering the idea of extra-terrestrial life; but didn’t have any source material or direction. Kubrick was searching for the best way to make a movie about Man’s relation to the universe, and was, in Clarke’s words, “determined to create a work of art which would arouse the emotions of wonder, awe,…even, if appropriate, terror”. Kubrick met with Clarke, and hit off a relationship. According to the book’s opening notes, the book and the movie were written nearly side-by-side; and is based of Clarke’s short story “The Sentinel”. Towards the end, Clarke’s writing wasn’t much ahead of Kubrick’s filming. Kubrick would even come over to Clarke’s place for dinners to talk while Clarke was finishing the book, and Kubrick was filming right behind him. Consequentially, the book and movie parallel each other quite well. While the movie follows the book very closely, we get a LOT more helpful details and explanation in the book than the movie version. We start with our early simian ‘ancestors’ not doing so well. They’re barely scraping by and in a constantly daily struggle for basic survival. They then encounter the monolith; which mysteriously just appears outside their camp one day. It is presented as an entity/machine actively wishing to changing them. The simians start making huge, evolutionary leaps forward in capabilities as the monolith ‘grabs them’ with an invisible force each day. One by one it teaches them to use their hands, perform dexterity tricks, and even bits of thinking, etc. The monolith isn’t perfect though – one of it’s experiments accidentally kills one of he simians. Yet, the changing takes place better with some than others and we soon see the simians start to thrive and use the first tools. It marks the first great turning point for man. The monolith has clearly changed the course of evolution of these primitive creatures. Fast-forward to the near future. We encounter a team of men flying to the moon. There is a fake quarantine in effect to keep a the discovery of a monolith (called TMA-1) a secret. In the book, we get a clear picture that this monolith is designed to be a cosmic ‘trip-wire’. It is described as having been deliberately buried; but emitting a huge magnetic field that made it almost impossible to miss by surveying crews. After it’s dug up, the first sunrays of a new dawn on the moon touch the monolith’s surface and activate it. The tripwire of digging it up has been cut. The monolith sends a massive signal towards Saturn while deafening those around it posed for pictures. Fast-forward a bit further to the Discovery on it’s way to Saturn (in the book). In the movie, the special effects guys apparently couldn’t get a facsimile of Saturn done well enough for Kubrick, so he decided to use Jupiter instead. HAL the computer then does what he does best – go crazy and kill everyone but Bowman. Bowman shuts HAL down and is finally told by Earth that his mission is really to go to the moon of Saturn where the signal of the monolith from the moon was sent and find out what is there. We get the first clues that HAL went crazy because it was told conflicting information about the true nature of the mission, was forced to ‘lie’, and hence killed the crew in order to protect the real mission which they were in danger of discovering. It’s an interesting side thread of how man can easily do this sort of mental gymnastics, while computers do not. Symbology with man’s own evolutionary pains abound. In the movie, this is where everything goes crazy – and we get no dialog for a long time. Bowman descends to the surface of the Saturnine/Jovian moon and discovers a gigantic monolith. It appears exactly the same as the one of the moon – but hundreds of times bigger. Bowman utters his famous phrase “My God, it’s full of stars” and disappears. In the movie, this is where a psychedelic trip down the rabbit hole commences. In the book, it’s because Bowman sees that the monolith is actually a stargate, or wormhole entrance. He is seeing the stars of the place where the other end lets out. He enters, and is taken on a fantastic voyage across the galaxy. He makes a stop at a cosmic ‘switchboard’ planet which is bathed in completely inverted light – implying a hyperspace of some sort. He pops out again to pass great fleets of dead ships all floating lifeless next to a large dying star. He is pulled in and sees a smaller white star orbiting the larger and is pulled into some sort of energy field where he awakes. He is now in the famous white apartment of the movie. Everything there has the appearance of reality; but is all fabricated as if looked at through TV. Books open but have no real words in them. The food is packed in all kinds of familiar containers but every one contains the same blue, edible paste. Everything is a kind of ‘set’ piece. His TV actually works, and broadcasts shows from several years back. In one show, however, he sees a program in which he’s in the exact same hotel room as he is now. Clearly his ‘keepers’ modeled it on what they saw on our television. Bowman is then stretched and twisted, just like his earlier simian ancestors. But this time, the evolution is on a whole new scale. He can travel across the galaxy with a though. His corporal form becomes mutable in age/time until he finally realizes he no longer needs it and transitions from his form to a higher form. He travels back to earth where he destroys all the orbiting nuclear missile platforms with a thought. He knows he is now to help his earth-bound brethren reach his new state of evolution. The book ends with him pondering how, but knowing “He’ll think of something”. In this state, he is a star child. A new being. Capable of traveling infinity of space and time and change things with the force of his will alone. It is our next evolutionary step. So, we see the monolith is the active ‘force’ of evolution – the thing that facilitates a dramatic shift of our being to something higher. We see two clear evolutionary steps of man. From animal -> man -> star child. Clarke indicates the monoliths have come from alien intelligence and origin; but the aliens nor their motivations and purpose are ever revealed. In a broader sense, the monoliths are a symbol. They stand for a key moment, a key input, a flip of a chromosome, a flash of …something… that sparks transformation and evolution of a species. Kubrick/Clarke made that symbol a black box in the dimensions of 1,4,9. It indicate intelligence, form, and perfection instead of randomness and chaos. The monoliths are symbols of something we do not know; but caused man to become something more than the other animals around it. In many ways, this symbol is mutable. One could even posit that while Clarke choose to attribute the step to higher alien intervention, theists might attribute it to God. As a symbol, both of these could work. Because of all this, 2001 is a great movie – but only once you get a much better picture of what is going on. Reading the book is a huge step in that direction. I give this book a solid A- since it helps one understand the movie so much better. It is near required reading, however, for those that wish to understand and read the first exposition of this often-reoccurring theme of alien intervention in human evolution that is so prevalent in modern sci-fi. The Origin program worked fine, but it was annoying because sometimes I forgot I’d opened it and having the ‘broken icon’ button on your toolbar isn’t exactly helpful for finding it. I tried right-click setting properties. Changing the icon to a different icon then back. Removing the program and re-pinning it. Nothing worked. Upon restart, your entire icon cache will get rebuilt (which could take awhile). Mine took about 2-3 minutes during which the machine was almost unresponsive. After that the icons re-appeared and all was well. Link to script that does all this for you and further information.